← For Chicago Will It Be Berdardin Part Two? Posted on July 28, 2014, in holiness, liturgy and tagged communion, holy mass, immodesty, irreverence, low expectation catholics. Bookmark the permalink. 62 Comments. LG, you are batting 1.000! Keep it up! We need to stop making excuses for bad behavior. There is always a one time thing that can be forgiven, but playing fast and loose with decorum has led us to where we are. I’m not sure it’s “decorum” qua decorum, but an utter lack of respect for– and understanding of– what’s before us and what we’re participating in. But have we *seen* the way he celebrates Mass? It’s simpler than Pope Benedict, sure. But still reverent. It’s important to view Pope Francis and Pope Emeritus Benedict as not pitted against each other, but as the lower and upper boundaries for what’s acceptable. Perhaps we can liken Francis to Gregorian chant, and Benedict to Sacred polyphony? It’s a really, REALLY far cry to even infer from the way Francis celebrates the Mass that sloppiness is okay. It’s not. Very substantial article. Honestly, it’s always been the challenge to put this issue at the pulpit with proper and correct catechesis. Plus, address this pastorally with a compassionate, charitable and understanding heart; less judgemental. That implies that we’d ask ourselves: “what would Jesus do in this situation?” Still, we do our duty as pastoral agents to remind ourselves of the twin virtues: justice and mercy, while embracing the christian attitude of fraternal correction. You hit this out of the park!! Here’s the thing about the field-hospital part: the Church is indeed a field hospital with the strongest, most potent medicine of all. How exactly does irreverence at Mass acknowledge that we recognize this? Women dressing ‘provocatively’? What exactly are they provoking? I am a full grown man responsible for being reverent all on my own. Modesty is a very personally interpreted thing. What was modest to my mothers generation was immodest to my grandmothers. Referring to a woman’s clothing as ‘provacative’ infantalizes men & makes women responsible for our sexual desires. That being said I totally agree w/ the leavi early thing & the kneeling. At my church there are only kneelers in the first five rows and it just feels wrong not to kneel during the liturgy of the Eucharist. Yes, modesty is somewhat of a relative thing, but yes, I think it is reasonable to say short shorts and a lace halter top a with cleavage keyhole cutout aren’t appropriate to wear to Mass. Seriously. And yes, I’ve seen that outfit at Mass and a number of other similarly atrocious choices. Thank you Debra. That is exactly the attitude of immodesty I was referencing. Thank you for your comment. As far as immodesty and who is responsible, it is both the woman and man, who sees her who are responsible! “Woa to you, who causes one of my little ones to sin.” We are all God’s little ones. It is never a good idea to test Satan. Modesty is not rocket science. You are either reverent or you aren’t. Furthermore, you may be the only man on earth who is not distracted by the accentuation of every crack and crevice of the female body in Mass, but for those who have red blood running through their veins, it is the responsibility of each of us not the be a distraction in the most important moment of our day. I am a 55 yo woman–and immodest dress is a real issue to me. Instead of “What exactly are they provoking?” How about this question: “Why are they trying to provoke it at Holy Mass?” Tops that leave bra straps showing, wearing leggings instead of pants, short shorts and short skirts…..Why? 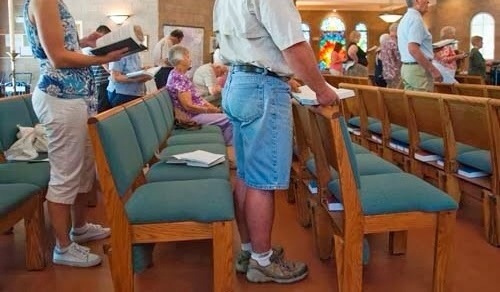 What is the purpose of dressing this way–at Mass (or any other time really)? Women objectifying themselves as sexual objects. You can dress attractively without body-hugging outfits or bareskin. To me it is a matter of respect and reverence. Dressing like you are heading out to a bar is not appropriate for Mass. Thank you for your comment Cindy. Completely agree with your sentiments. Once I went to a parish that was not my home parish. I knelt to pray and prepare myself for mass with eyes shut. As I heard the shuffle of people arriving get louder I sensed that the time to begin mass was near so I wrapped up my praying and opened my eyes (I was still kneeling). What I saw was a very attractive woman entering the pew in front of me with her very attractive backside, barely covered in a mini dress, inches from my face! Now, I AM A MAN and can be prone to lustful thoughts (mea culpa). this woman and her backside did shake my resolve for a while and served to distract me in my quest for spirituality of the moment. Was her dress acceptable in public? Yes. Was it acceptable in church? No. Don’t act like you don’t know what is provocative or not. This beautiful young woman was not trying to be provocative, she did not know better, but she deserves to be told that she is in error and I, as a fallible man, deserve a place to set aside such worldy thoughts. Tank, tops, short shorts, flip flops, immodest summer clothing of every sort. I have seen them all at Mass. Most disturbingly, it is often the attire of teenage girls attending Mass with their parents. Boys in sloppy sweat pants and ratty shirts. I suppose it’s the same mentality on the pat of the parents…at least our children attend Mass. No family leadership, either. “We don’t know what’s in their hearts.”? By dressing for the beach, etc, for Holy Mass, it becomes blatant what is in the heart. Its the beach. Its the sports teams on the jerseys. Its the rock bands on the T-shirts. Its easy to see as we all wear our heart on our sleeves at Holy Mass. Wait until these gals get old. They’ll start dressing more modestly by golly! One only wishes. I had the unpleasant experience of seeing 60 year old thighs in a mini skirt yesterday and could see the old gal’s underwear. She probably thought she was looking pretty good. Where are the kneelers – That’s a part of the problem – No idea what and Who the Euchriat is. Very sad and unfortunately often true. Poor catechesis…both by word and by example. Great thoughts here. But a solution: perfect yourself, and you perfect the Church. We are each the Church; I am, and you are. And if what we take from the Mass is more of what we saw in or on others than who was on the altar, then we not only were brought into sin of one degree or another by clothing choices on -or hardness of hearts in- others, but we also allowed ourselves to be distracted again this Sunday, just like last Sunday, and the Sunday before that. You are only at the Mass for one thing, and that is Christ. If you missed Him and didn’t overcome the world’s distractions, all you bring home is frustration and distrust in the Church’s future. So you also hold the Church back with this angst and disapproval in its lovable members- members who are worth loving, just like you. Perhaps one side of the coin is needlessly and constantly overlooking others’ visible faults that could be corrected, but perhaps the opposite side of the coin is living as a Pharisee and placing others’ participation as you understand it above your own work: to perfect yourself first for Christ. I know the message here was that we’re not correcting what’s wrong with what we see in Mass, but what’s wrong with what we see in Mass is that we’re seeing everybody else and not the sacrifice of the Mass! Perfect yourself. If you are distracted with your vision, practice praying with your eyes closed and ask for help to see beyond this world. Don’t think, well I should be able to pray with my eyes wide open, this is Mass! Remember, this is Mass in a fallen world. Fallen …but redeemed. Practice focusing everything on what’s happening up at the altar: He’s the reason why you’re there, so give Him your full attention. Perhaps this is the narrow path, even in the midst of Mass: to not allow yourself to focus on others’ faults when you can set a beautiful example as a Saint-in-the-making who doesn’t dwell on the negative all around, but grows in greater gratitude for the sacrifice of the Mass and simply being able to attend in your own body. If only the first five pews are where the kneeling people sit, go to the sixth pew and 1) don’t give yourself the opportunity to look at anyone not kneeling 2) create yet another kneeling pew for the Church in yourself, even if for a while you’re the only one in the sixth pew on your knees 3) get a closer view of the altar! It’s a win-win-win! Everything is a work-in-progress, and the surest way to improve the Church is to improve the Church starting with yourself. You will be a beacon to those who have also been distracted, and to those who are/aren’t aware of the distraction they bring. You might notice, being the observant people you are, that that includes everybody at Mass. Be a Saint-in-the-making for the Church, and you will make a change. No, we should not say immodesty or irreverence are fine (and say ‘judge not at all’), but consider: how reverent can WE be if our eyes are looking at or looking for the next fault to correct in others instead of adoring Christ in our midst? Sara – while the sentiment of your comment is laudable, the theology is in error. “We” are not the Church. You aren’t; I’m not. The Church is the mystical body of Christ in which you or I am incorporated as a part by the mystery of grace. The Church is perfected by her head, Jesus Christ. She is not perfected by my actions or yours. That said, yes, those of us in the Church must make our own sanctity a priority because personal holiness is evangelical. The danger in your assertions is to reduce the Church to the congregation, which is a common mistake that is far more dangerous than it first appears. In fact, the author’s comments could be restated in such a way as to say that the problems he rightly identifies are a direct result of precisely this overly individualistic theological idea. The author’s very well stated point is that we’ve exalted the personal over the objective expectations of the institutional Church – to our great detriment. Again, while I laud the sentiment in your comment, the basic theology is inaccurate. We must take personal responsibility for ourselves, but that in no way lightens the legitimate burden placed upon others who are Catholic. I.e. the plank in my eye doesn’t mean that the splinter still isn’t in their eye. Thank you for your response Father. Without ascribing intentions to your post or being unkind, it seems unwise to prescribe naivete as a kind of piety or holy disposition. The choice to ignore significant matters within the Church – including the personalities of those of great influence – can only be disastrous. One need not judge the soul of another in order to judge the actions or dispositions of another. I can say that so-and-so is not a strong leader without saying their a bad person. I can criticize a politician who supports abortion and even campaign against them without “judging” them in the way Christ condemns. In fact, the failure to act as a good citizen by voting for life is itself sinful… Something that St. Paul would have reminded the Philippians when he advised them to think on “whatever is good” and true. The author makes an honest assessment about Popes Benedict and Francis. That assessment directs the reader toward particular conclusions and particular personal choices. This is precisely what Vatican II called for from the laity! It called for the mission of observing the signs of the times and, in another document, the use of media to evangelize. I would further argue that the author has not cast aspersions upon Pope Francis in this article, certainly not by the mere act of comparison. Always hope. Obedience and docility too. But also vigilance and authenticity in our words and actions. Low expectations does not equate to charity or mercy. Keep praying to God that you do not fall into despair. Things are getting better. God bless. So the solution is… what? I don’t mean to be flippant but I have read complaints about people leaving Mass early 100 years ago ( pre-VII ). As for the modesty/tasteful attire, that is honestly a reflection of the decline of the power of shame in our culture. I really can only focus on myself and my state. If the parishioner next me in her tank top and shorts accompanied by her husband ( you hope ) wearing his Harley shirt turn to me, I will acknowledge them as brothers and sisters in Christ. I also will recognize that they are responding to some call to be closer to Him by being there with me at Mass. I thank you for your comment. My response is the post itself. I agree with you that often we are presented with rare “what if” scenarios to justify irreverent behavior, but just because the scenarios are rare does not mean that they are impossible. I have a friend who looks very healthy, but has had three knee surgeries in the past four years. She cannot kneel. I myself cannot kneel for extended periods of times (upwards of 30 minutes) or when the kneelers are built such that I’m at an odd angle. It’s very easy for a young healthy person to look around at other “seemingly” healthy people and judge whether they kneel or genuflect or whatever but it is just as easy to forget that invisible disabilities are much more common than able-bodied people realize. Thank you Claire. I completely agree with you. God bless! Just wanted to add this agreement as well. As a daily Mass attendee and someone in my 20s who has chronic pain in one hip that is, for the most part, manageable with doctor’s help, I do get flare-ups that I need to remain seated throughout the Mass. I understand how this may be perceived as irreverent and thus try to sit in the very back. I am marveled at a woman in her 90s who attends daily Mass, with cane too, and kneels. It shows her devotion and faith, and assists me in my own faith development and helps give me a ‘I can kneel too’ spirit. Thanks for sharing your experience. Both you, and this wonderful elderly woman, are examples of humility and charity. God bless! The problem is undeniable, and you have stated it beautifully. There seems to be some confusion in the comments, though. Who, specifically, should exhort and correct? I agree with a few of the posters who, as lay people, feel it is not their place to make comments or corrections. Sometimes people use, “it’s what’s in their heart that counts” because they are trying not to be judgmental, pharisaical, or scrupulous. After many years of struggling with those sins, a good confessor finally taught me how to pay attention to the Mass and not to those around me. On the other hand, priests and bishops DO need to correct and exhort. They have not only the authority to do so but the obligation to. It is not judgmental for a teacher to instruct a student. And it is our priests and bishops who have most grievously succumbed to the culture of low expectations. They have approved amphitheater-like church architecture where the pews slope downward toward the altar. They have approved churches with no kneelers. They have ripped holy images out of churches in favor of modernist “art.” and so on. Not everywhere, of course, but in enough places for these problems to be considered systemic. What can I do? Like Sara posted (I agree with Father’s correction of her theology), all I can do as a lay woman is train up my own children and be reverent myself. If anyone happens to bring up the topic, I speak the truth with charity. But I will not spend Mass making internal comments on other people’s behavior. It’s not my place. I wish my pastor would do more. To clarify, I do not mean to accuse all priests, or even most priests of enabling this behavior. Many, many holy priests are at work in the Church! I’m just a sheep, and the rest of the people in the pews are sheep, too. We need more good, courageous shepherds. Very well said. Thank you for your comment Anne! The problem with condemnation of such behavior is that we often DO NOT know the reason for such behavior and we must refrain from the sin of detraction. These issues should be left for the private inquiry of the Pastors. The problem here is their unwillingness to pay attention and/or to inquire and communicate clear and legitimate expectations. This is so beautifully written,it’s exactly what I have been trying to say for so long and I always get accused of being hateful and judge mental which leaves me feeling dejected and sorrowful.I wish I could write and put my thoughts together like you!Keep up the good work and thanks for being a lighthouse in a dark sea. Isn’t this idea that it’s what in the heart that counts (implying a spirit/body separation) a Gnostic idea? It seems like this Gnosticism is a major problem and has infiltrated the church from the culture at large. I was raised to dress in my best to go to church and have continued to do so, even when those around me look like they are on their way to Walmart. The casual dress that is common in most churches has been accepted because the priests and the bishop don’t say anything least someone is offended. It really bothers to see a Eucharistic minister wearing shorts and flip flops standing next to the priest. Their casualness is reflective of the lack of respect and reverence in our churches today. I just wish our priests and bishop would speak out against this behavior. Brian, this is the absolute BEST…thank God for you and thank God for your clarity. I have been yelling this from the rooftops for a very long time: when you set the bar low, that is what you will get. The low bar has produced the rotten, ugly fruit of lukewarm Catholicism. I firmly believe this, and I will fight for raising the bar for reverence and holiness because GOD WANTS IT. And contrary to the oppositions comments that “He doesn’t care”: OH YES HE DOES! Great article! This is very true, however that does not mean that an individual lay person should take it upon themselves to berate an individual person showing irrevereance, because it is very possible that the mentioned circumstances are in play. Fraternal correction is only appropriate from those who bear either authority or a closer bond of charity than simply going to the same Mass. If it is endemic, the correction needs to come from the pulpit. But what good does it do pointing out who isn’t kneeling and who isn’t staying and who is dressed improperly? I have enough of my own issues to worry about without worrying about other people’s. I agree with everything in this article, except one: Why are modesty and appropriate clothing mentioned only for women? That makes no sense. It’s no more disrespectful for women than it is for men, who are (by and large) more likely to dress inappropriately than women. Shorts? T-shirts? Sports jerseys? Dirty clothing? Those appear more often on men than on women at Sunday Mass. I am regularly averting my eyes from lewd dress; why can women not this? Men, we are no better in cutoff jeans or tank tops. A golf shirt and cotton slacks is not that hard. I believe it is more important to applaud that a person is attending Mass for the intention of worshiping God. It is not my business to criticize or judge others appearance or style. It is what is in a person’s heart that matters. If everyone is focused on the love of Christ being poured out in the Mass and their own spirituality then there is no room for nitpicking what someone is doing or wearing. I love this! I haven’t read the other comments, so I don’t know what others thought. but you are spot-on about these things. Everyone is so afraid to demand certain standards in the fear that we might “offend” someone, or drive them away. I figure, if that’s all it takes, it was a shallow faith lacking in all humility. Great blog. I’m going to pass it along to my pastor and maybe the worship committee.